People who are into action cams rejoice. While for the most part, camera manufacturers failed to excite much at the CES, fans of action cameras got two interesting and varying efforts courtesy of Sony and Nikon, the two already-established players for ground-breaking camera tech. The new HDR-AS50 is a pocket-sized wonder which comes with a 11 megapixel 1/2.3-inch back-illuminated CMOS sensor, and a wide-angle f/2.8 lens. It also brings support for SteadyShot, which Sony also thinks is perfect for mounting on something like a drone and is three times more effective than before. It can be used to shoot 1080p Full HD videos at either 50 or 60 frames per second, as well as 120 fps slow-motion videos at 720p. Further, you get up to 3X zoom, options of wide/narrow shootings and eitehr 8 MP still or time-lapse photos. No worries if it takes a dip in water, since it is certified as lasting 60m of underwater action. The design is also more intuitive with larger buttons at the top now. The high bitrate XAVC S format is now supported. Last but not the least, you got the new Live-View Remote support, which is both smaller and lighter than before. Alone, the HDR-AS50 costs $200 while bundled with the Live-View Remote, that pushes up to $350. Sony’s not the only one with an action camera, because Nikon is now officially in the foray with an effort that’s as different to Sony’s as you can imagine. 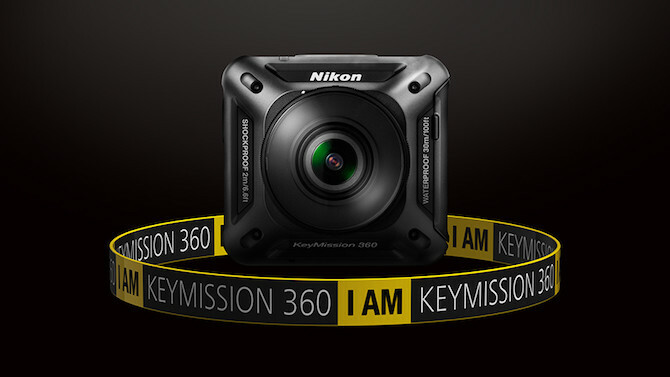 The KeyMission 360 is the first Nikon to shoot 360-degree videos, that too in 4K. It has the form factor of a cube, similar more to the GoPro Session 4. It is built to last too, being shockproof up to 2m and waterproof to 30m. Here, you get image and lens combination on the opposite sides of the camera that get combined to get a seemless image. There is also a built-in electronic shake reduction that can be enabled even in the middle of recordngs. For connectivity, you get options like Bluetooth, NFC and Wi-Fi. The KeyMission 360 is coming this spring but pricing details aren’t known yet.